Gustav Adolf Huber was born November 13th 1872, the second child of a family of pastry bakers. He studied music from 1888-1892 with the outstanding violinists Carl Halir and Adolf Brodsky, to name but a few, first at the "Großherzogliche Orchestra School" in Weimar and later at "Leipzig Conservatorium". After his studies he was employed as a second violinist in Sweden. From 1895-1905 he was the conductor of the singing academy Robert Schumann in Magdeburg. 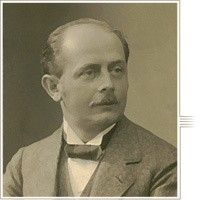 After already standing in for a year for Rudolf Fischer he took over the leadership of the orchestra academy from 1910-1920. As a music teacher he gave lessons in violin and piano at the Conservatorium, as well as to private students. Temporarily he was the conductor of the church choir of Paul's Church in Magdeburg. Adolf's numerous works give proof of his compositional and musical-pedagogical skills. Adolf Huber died in Magdeburg November 1st 1946 aged 73.